Seven happy contestants or contestant teams walked away with awards and prizes at the culmination of Saturday night’s 2018 Darien’s Got Talent show at Darien High School. Editor’s note: This article originally was published Saturday night. More information about the event has been announced by Darien Arts Center and has been included below at 2:12 p.m., Monday. Cary Wang, age 9, playing “Brillante,” Op. 34, No.3, winning him first-place in the children’s category. Cary WangThe winner in the adult category was Tom Giles, who played “Skedaddle,” his own composition on the piano. In the Children’s Category, Cary Wang, who also played the piano on stage, was the winner. Tom Giles, the first-place winner in the adult categoy, on the piano, playing a work of his own composition. 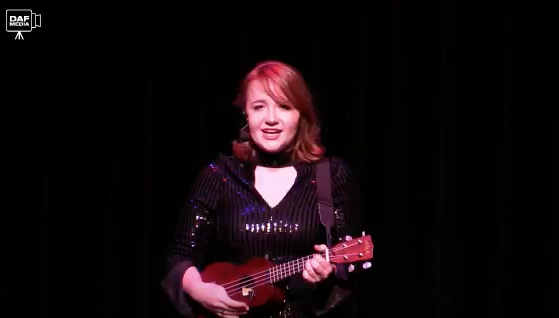 Grace Hebert, singing “Hit the Road Jack” while playing a ukelele. FIRST PLACE: Cary Wang, age 9 — for his piano performance of “Brillante,” Op. 34, No.3. Third Place: Kai and Mia Sparks — Mia and Kai Sparks for their piano duet of “Le Pas Espanol,” Op. 56, No. 6. The People’s Choice Award went to Isabelle Seeman. 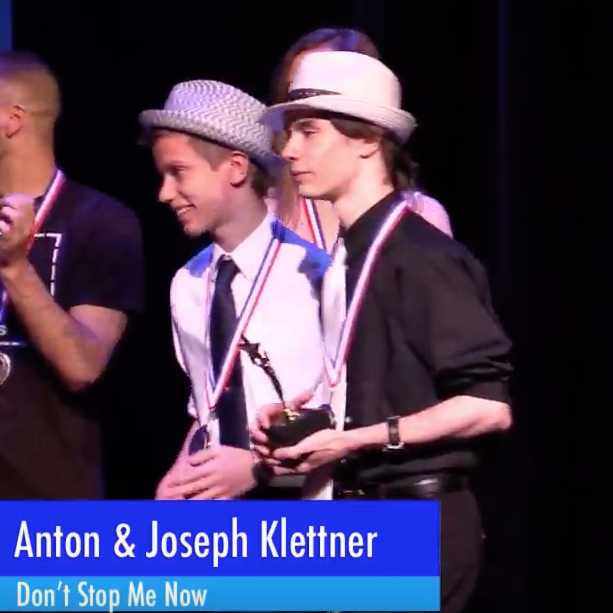 Anton and Joseph Klettner just after receiving their prize. Seasoned director, Carole Claps orchestrated the evening’s performances seamlessly, with the skillful help of Chris Coogan as musical director and Raymond G. Michaud as Master of Ceremonies. During the judges deliberations, a slideshow of entries from the DAC’s smartphone photo contest, Pic Darien was screened. Executive Director Amy Allen thanked sponsors, producers and the crowd for their support, and invited all to enjoy the Darien Arts Center’s offerings. A total of 150 guests — including sponsors, winners and judges — attended the exclusive post-show party, “Darien’s Got Taste,” enjoying outstanding cuisine, entertainment by pianist and Darien High School 2018 graduate Jonathan Kim and celebrating with winners. Donors to “Darien’s Got Taste” included Atria, Aux Delices, Blue Wave Taco, Cesco’s, Chocolate Works, Crunch Fitness, Fisherman’s Net, Fjord Fisheries, Height’s Pizza, Meatball and Co., Michael Josephs, Scena Wine Bar, The Goose, Trader Joe’s, Uncle’s Deli and Whole Foods. Baywater Properties, Maplewood, Shipman and Goodwin, Janney, The Darien Sport Shop, Dr. Rhett Drugge, ERI Builders, Dana Fead, Realtor, Moffly Media, David Osherow, DDS, Palmer’s Market, The Pawprint Market, Ring’s End, Total Printing, Darien Athletic Foundation and Andrew Stefanou Salon and Spa generously sponsored the fundraiser, which supports the DAC’s efforts in providing unique opportunities for all ages in dance, visual arts, music and theatre. For more information about the Darien Arts Center, which is located at 2 Renshaw Road, behind Town Hall, visit darienarts.org or call (203) 655-8683. 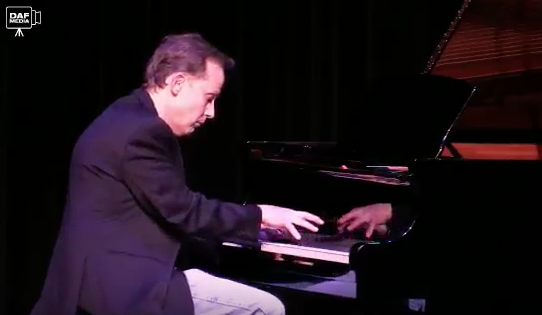 You can see the whole event here, on this DAF Media video of the two-hour event, which raised money for the Darien Arts Center. The finalists for Darien’s Got Talent in the adult category are: Benedetta Cordaro; Marianna DiMeo; Tom Giles; Grace Herbert; Ryan Pappolla; Christian Rottner; Erick Sanchez; Isabelle Seeman, William Shubeck; and Riley Wells. Finalists in the children’s category are: Caroline Donnelly and Noa Durocher-Pyun; Intempo Ensemble; Shannon Flaherty; Sophie Gilbert, Elle Mitrano and Isabelle Hole; Anton and Joseph Klettner; Samantha Lundstrom; Milana Melnick; Mia Petruzzo; Mia and Kai Sparks; Natalie Treacy; and Cary Wang.